SAP Intelligent Asset Management solutions enable digital transformation of asset management using machine learning and real-time data from IoT-enabled smart assets to bring intelligence to your entire supply chain. You can continuously improve processes and predict outcomes, collaborate across networks and offer differentiated service, while generating new revenue streams and developing new ways to compete and disrupt your industry. 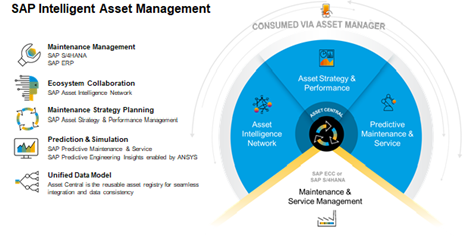 SAP Intelligent Asset Management solutions comprise the five cloud-based SAP offerings that share a common asset data called Asset Central Foundation. This is the reusable foundation layer across the overall EAM portfolio. This five offerings are SAP Asset Intelligence Network; SAP Asset Strategy and Performance Management; SAP Predictive Engineering Insights; SAP Predictive Maintenance and Service; SAP Mobile Asset Management. They enable full digital representation of physical objects, including real-time sensor data for end-to-end visibility and real-time insight across the operating landscape of connected assets. One big issue facing enterprises on the journey to intelligence is the fact that massive amounts of data generated outside their enterprise resource planning (ERP) systems are not being harnessed, this data provides a wealth of information that can transform asset management in ways that help companies to maintain information transparency throughout the entire asset lifecycle and within the ecosystem of operators, equipment manufacturers, and service providers. Asset central foundation is the reusable asset registry for seamless integration and data consistency. Asset central integration capabilities brings together sensory information, installation, service information and contextual information. This is intended to be there throughout the asset’s life cycle: engineering, production, installation and operation, through to decommission. The record is maintained in the cloud and in this way the digital world records what is going on in the physical world. The ERP integration feature ensures asset information is consistent and transparent by connecting SAP Intelligent Asset management solution in the cloud with Enterprise Asset Management (EAM) in SAP ERP. Currently, integration feature supports data synchronization of critical asset information such as equipment, functional location, documents, notifications and work orders. With the November 2018 release, many new features were added to improve the integration experience between Asset Central Foundation and SAP Enterprise Asset Management in SAP ERP. A new Asset Central tab is introduced for objects such as Equipment, Functional Location and Notification that are applicable for SAP GUI transactions. Functional Location Hierarchy The functional location hierarchy in SAP EAM can be synchronized with asset central. Work Order/Notification Work order and Notification for functional location in SAP EAM can be replicated to asset central. Documents Documents uploaded as links (URL) in asset central can be synchronized with SAP EAM. Extension options Enhancement points and sections are introduced within the replication programs. The ERP integration feature allows everyone to access the right information about assets, thereby improving the maintenance execution processes that make businesses more competitive by lowering operational risk, maintenance costs and increasing the uptime of the assets. To learn more about the integration features in intelligent asset management, read the integration guide on the SAP Help Portal https://help.sap.com/viewer/product/SAP_ASSET_INTELLIGENCE_NETWORK/1808/en-US. Do you have also a guide for integrating S/4HANA System with AIN?